How does an economist choose their area of research? What are the influences on how they pursue their goals? What do they see as the next steps in their chosen fields? The answers to these questions will be central to the way that young economists – and indeed academics from any discipline – will take decisions in their own careers. 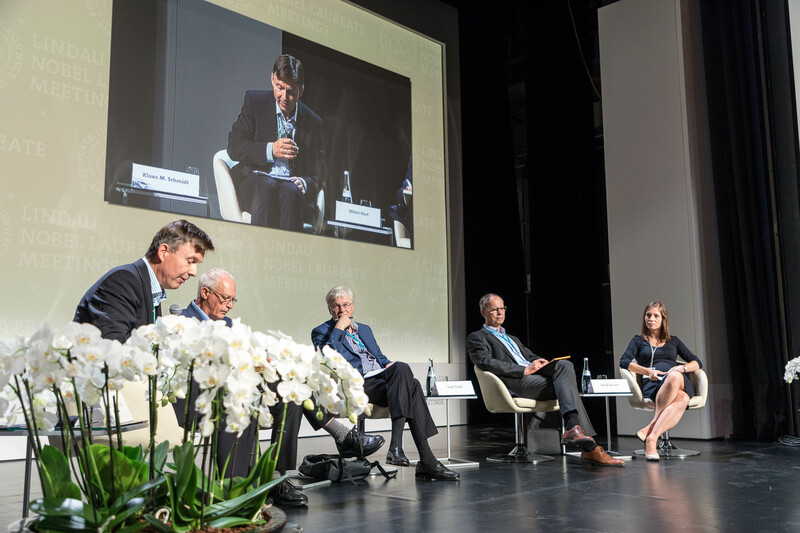 Three Nobel Laureates who won their prizes for separate work on contracts, incentives and organisations took part in a panel at the 6th Lindau Meeting on Economic Sciences. They discussed the personal academic journeys that led them to make the intellectual findings for which they were recognised – and the people and research that had influenced them. Oliver Hart, who won the 2016 prize for his work on contract theory, was motivated to look at incomplete contracts after a conversation with Sanford Grossman in which they asked why one firm would ever buy another firm rather than just trading with it. As trained microeconomic theorists, they decided that they could add to the informal existing literature. After grappling with issues such as the role of authority and the idea of requirements contracts, they realised they were thinking about it in the wrong way. ‘The penny dropped that we were thinking in complete contract terms when we realised it would be better to think about it in incomplete contracting terms,’ Hart said. ‘In complicated relationships that take place over many years, it is very hard for the parties to foresee the future and write the idealised state contingent contract.’ Hart and Grossman went on to write the highly influential paper Incomplete Contracts and the Theory of the Firm. Bengt Holmstöm, who shared the prize with Hart in 2016, took a less direct path towards economics, gaining an undergraduate degree in mathematics at the University of Helsinki and a masters in operations research and doctorate at Stanford. While working later for a large conglomerate in Finland, he was asked to implement a corporate planning model. Jean Tirole, who won the prize in 2014 for his work on market power and regulation, said that he believed it was impossible to develop thoughts in a vacuum. Although he admitted he found it hard to codify his own research, he focused on three routes. The second route was to be motivated by the research of other academics, which included the work of Hart and another fellow laureate, Eric Maskin, who was at the Massachusetts Institute of Technology when Tirole was there as a doctoral student. Tirole went on to write a paper, Unforeseen Contingencies and. Incomplete Contracts, with Maskin who had earlier supervised his PhD. The young economists in the packed theatre hall put a range of questions to the laureates including: whether university tenure was an optimal contract; how their subject area had evolved and future areas for research; and bank compensation in the wake of the global financial crisis. Two questioners asked the laureates about who had influenced them and what were the inconvenient questions that young scholars needed to ask. Hart cited a number of economists including Kenneth Arrow and Gerard Debreu, laureates of an earlier generation who gave their names to the theory of general economic equilibrium, as well as another laureate, Ronald Coase. Holmström urged young economists to focus on finding answers to small questions that can then be expanded. ‘I have tried to answer some big questions but they have never gone anywhere,’ he joked. Tirole struck an inspirational final note saying that the Nobel Prize had turned him into a somewhat reluctant public intellectual in his home country of France. ‘You have to help design institutions that are going to be resilient in case a bad president comes to power. Mechanism design is very important,’ he said.